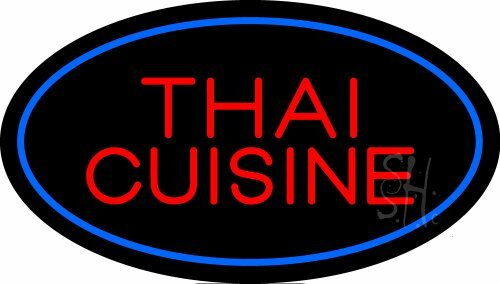 Thai Cuisine Oval Blue Outdoor Neon Sign 17" Tall x 30" Wide x 3.5" Deep, is Handcrafted with Real Glass Tube Neon Sign. !! !Made in USA!!! Colors on the sign are Red and Blue. Thai Cuisine Oval Blue Outdoor Neon Sign is high impact, eye catching, real glass tube neon sign. This characteristic glow can attract customers like nothing else, virtually burning your identity into the minds of potential and future customers. Neon signs can be left on 24 hours a day, seven days a week, 365 days a year...for decades. There is no light form in existence that has the visual impact of neon. This is a 100% hand crafted, real glass tube neon sign. Thai Cuisine Oval Blue Outdoor Neon Sign is made by an experienced neon glass bender. Thai Cuisine Oval Blue Outdoor Neon Sign can be used both indoor and outdoor. OUTDOOR NEON sign take additional 3 to 5 more days for production. Neon is mounted on aluminum commercial grade housing. Clear plastic protective front cover. Heavy duty weather resistant 110 volt UL listed transformers ready to be hard wired. Easy Install hardware & chain are included. All neon material use as UL Requested. Professional Electrician Installation suggested. Thai Cuisine Oval Blue Outdoor Neon Sign Outside backing material is Aluminum and font is Plastic Cover. 1 Year Warranty on electrical components & transformers. We provide 1 Year Warranty on electrical components and on standard transformers. Please contact us for rush shipping before ordering. Outdoor, Flashing and color customization possible - please contact us for proof before placing order. 100% No Breakage Guaranteed. YOUR NEON SIGN WILL ARRIVE TO YOU IN EXCELLENT CONDITION. WE HAVE LESS THAN A 1% BREAKAGE RATE. Thai Cuisine Oval Blue Outdoor Neon Sign is handcrafted with Real Glass Tube Neon Sign.